I like this idea. 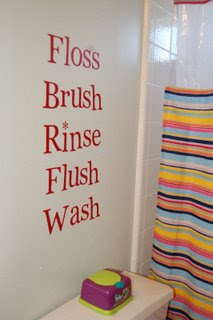 Teach your kids the basics of bathroom etiquette, while decorating with some fun wall art. See more fun home ideas at Help Me. LOVE that idea! I wonder how she put them on the walls. Decals? That is so cute! I might have to use it! To answer Tawni's question (I hope you don't mind) it is vinyl. I actually cut and sell it.